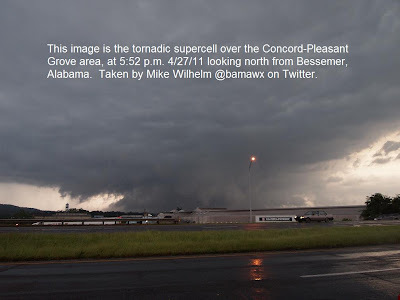 This is a personal account of my experiences as a storm chaser on April 26 and 27, 2011 in Mississippi and Alabama. This is just my story, as best as I can tell it. Over time, as information becomes available and my memories are triggered, I will periodically update this post with additional narrative, links, photos, or video. I partially regret that I have waited eight months to compose a synopsis of my activities during the historic April 27, 2011 Super Outbreak of Tornadoes. The main reason we chase is to provide a public service by assisting in the warning process. My partner, John Brown and I have been Skywatchers for ABC 33/40 in Birmingham for many years. James Spann, Jason Simpson, Brian Peters, and Ashley Brand have assembled a great system of communicating with and training storm spotters for Central Alabama. It has been an honor to serve with this group for several years. John, Rick Lipscomb and I have spoken about our chase among ourselves and with friends, and we have all appeared on various local and national media outlets. Twenty four hours after the Tuscaloosa tornado, I spoke live by phone with KTEN TV in Texas. My most extensive interview was live on WHNT Channel 19 a few mornings later with Meteorologist Ben Smith. This is a shorter version of the interview as seen on the evening news. John was interviewed by ABC News Nightline and other media outlets. We told our story on the Weatherbrains podcast. In these interviews we told the story, but eight months later, I feel ready to relive the day in detail and put my memories in writing. I know John and Rick agree that it was a day that we will never forget and it will haunt us the rest of our lives. I have also spoken about the day on a few occasions with close friends, especially some of my closer friends in the weather community. Frankly, like others who witnessed the tragedy unfold, I have found it easier to spend the last eight months avoiding the subject. I usually post about my chase accounts immediately on this blog, but to this day I have said very little about my experiences on April 27. Witnessing the Tuscaloosa tornado was a shocking experience. I remember the next day my friend and fellow chaser, Jennifer New, asked how I was doing emotionally. I thought I was doing pretty well, but the depth and the shock of the tragedy really started hitting home in the coming days. She has encouraged me to tell the story. I think it is a story worth telling, and if I wait too long I will begin to forget details. The story of my April 27, 2011 storm chase actually began eight days earlier. I pay close attention to forecast models, especially during the primary severe weather season. I also pay close attention to forecasters who look at the models closely who are much more knowledgeable than I. As early as Tuesday April 19, ABC 33/40 Chief Meteorologist James Spann mentioned in his morning “Weather Xtreme” video (this is his map discussion that he usually produces twice a day) that severe weather was a possibility on the 27th. By the next morning, the 20th, James said it could be a “significant severe weather outbreak”. On Friday April 22, James was mentioning the possibility of tornadoes, as was the National Weather Service Birmingham in their Hazardous Weather Outlook. Models were quite consistent in portraying a setup favorable for tornadoes as many as five days in advance. I asked to be off work on Friday the 22nd. As April 27 approached, confidence continued to increase that there would be multiple waves of severe weather, including the possibility of long-tracked supercells. By Monday the NWS Birmingham was referring to the storm system as “dangerous” and predicted the possibility of “strong, long-track tornadoes”. I later wrote an extensive blog post showing details of how local media and NWS offices forecasted this event. With all of these ominous forecasts and the staggering severe weather indices that models were showing, Wednesday the 27th was obviously a day that I wanted to be out chasing. I was getting nervous, though, because I still had not been approved for leave at work. I finally received approval at 3:30 Tuesday April 26. I immediately texted my partner John Brown and we started formulating plans. He and I exchanged several texts and calls that evening. I also was contacted by my friend Rick Lipscomb, an Alabama native, who was going to drive up from South Georgia and tandem chase with John and I. The idea of the system coming in the form of two or three waves was still being shown by the models late Tuesday afternoon. By 4 p.m. portions of North Mississippi were placed in a "High Risk" area by the Storm Prediction Center. After leaving work, I immediately filled my vehicle with gasoline, drove home, studied every model and forecast I could look at, and called John and Rick. The three of us decided to begin the chase that night. We decided to meet in Cullman around 11 p.m. at the Days Inn parking lot on the US 278 exit on Interstate 65. I drove from Huntsville and got there at 11:10 and caught about an hour of sleep in my vehicle while I waited for John to arive from Birmingham and Rick to arrive from Georgia. After Rick and John arrived just after Midnight we discussed our plan further. We didn’t necessarily expect to see a whole lot at night but we wanted to be positioned in the best possible location for the main events on the 27th. We decided to head west on US Highway 278. Around 1:15 a.m. the Storm Prediction Center issued a "High Risk" for North Alabama and surrounding areas. We saw our first storm in Hamilton, Alabama around 3:30 a.m. It was a strong thunderstorm with intense lightning and gusty winds. Jennifer Watson of WVTA Tupelo reported a severe thunderstorm warning for Lamar and Marion counties in Alabama until 4:30 a.m. with the possibility of winds of 70 mph. As we headed toward Tupelo on US 78, we encountered another storm between Hamilton and the Alabama State line. The lightning was almost constant between 3:45 and 4 a.m. These were the first of countless storms we would witness over the next 36 hours. When we got to Tupelo we pulled into a Waffle House parking lot. I studied ongoing weather data as well as forecasts, and tried (mostly unsucessfully) to take a brief nap. Storms continued to fire that morning. Not long after breakfast, Pontotoc County, northwest of Tupelo, was placed under a tornado warning. At 9:15 a.m. there was a brief tornado at Esperanza, Mississippi, with minor damage. The clouds were impressive and very picturesque. We saw what might have been a wall cloud, but nothing definite. As with all of the storms we had seen, the winds were very gusty and the lightning was intense. I recorded some video of the skies when we ate at Waffle House, along with the storm west of Tupelo on US 78 from 9:12 and 9:30. The video includes my discussion with Greg Nordstrom, Instructor of Meteorology at Mississippi State who is also a phenomenal storm chaser. He expressed grave concern about the nature of the environment, the type of supercells that we might see during the afternoon, and the danger it would pose to the public and also to any inexperienced chasers who might be out driving. While we were in North Mississippi during the morning we were hearing about severe storms with numerous damage reports in Alabama counties such as Marion, Pickens, Fayette, Tuscaloosa, Walker, Jefferson, and Shelby. We later learned that the damage was more extensive than initially reported and that some of the damage was produced by tornadoes. After the storm we witnessed northwest of Tupelo, the temperature dropped into the 50’s in northeast Mississippi. We made the decision to drive southeast into West Alabama where the air was more unstable. As we drove south through Marion, Fayette and northern Tuscaloosa counties that morning we began to realize that the morning round of storms produced a great deal of damage to the communications infrastructure. This would prove to be a significant problem later in the day as it hindered people from receiving warnings. Power, cell phone, and internet service was out due to the extensive damage produced by the morning severe weather events. John, Rick, and I were handicapped for several hours without access to much in the way of weather data. We pulled up to a gas station and couldn't purchase gasoline because they were out of power and the credit card machines were down. Our instincts told us that supercell storms that afternoon would move through the I 20-59 corridor, but now we had added reason to chase in that area. We did not want to be stuck in Fayette, Marion, or Walker counties without data or cell phone service. For quite some time, John and I were chasing "old school", relying on nothing but NOAA Weather Radio, scanner, and occasional reports on commercial radio. Driving south through northern Tuscaloosa County we saw numerous trees down from the morning storms on Highway 171. I received a call from my friend Craig Woodham. He and his wife were considering driving home to Tuscaloosa from Mobile that afternoon. I advised against it. Craig told me that a family we know, Reginald and Danielle Eppes, who live in Coaling in eastern Tuscaloosa County, had apparently been in a tornado that morning at their home. You can listen to their miraculous story on National Public Radio, here. Here is another story on them in the UK's Daily Mail. Craig didn't know all of the details at the time, but that was a sad precursor of things to come for the Tuscaloosa area. Jim Stefkovich, Meteorologist-in-Charge of the NWS Birmingham gave a chilling and accurate prediction of what to expect after the morning storms passed, live on 100 WAPI's Matt Murphy Show late in the morning of April 27. John, Rick, and I stopped at the Burger King in Northport, across the Black Warrior River from Tuscaloosa just after Noon. The temperature was 20-25 degrees warmer than what we experienced near Tupelo. It was now up to the lower 80’s here! The air was very humid and turbulent. As we ate at Burger King, John Brown uttered these words, “Someone is going to die today. They just don’t know it yet.” Those words hit hard but rang true to Rick and I. One thing I like about John and Rick is they take the public service aspect of chasing very seriously. It is our goal that we can play a part in the warning process so that loss of life can be prevented. John’s words were sobering, and sadly, all too true. We stayed in Northport for nearly two hours, watching the satellite, radar, and mesoscale analysis page on the SPC site very closely. The severe weather parameters were off the chart! We felt like we were in the prime location, but all of North and Central Alabama was in danger. Finally, just before 2:00 p.m., we decided to head west towards Pickens County, near the Alabama/Mississippi border, west of Tuscaloosa. Storms were exploding in Mississippi. By 3:30 we were on a tornado-warned storm in Pickens County. This was the scariest part of the chase. John, Rick, and I debated as to what we needed to do to be safe. We were not really in the safest place relative to the storm. We were on the north side of Pickensville as the tornado formed to our east. After it formed and we drove east to follow it, we ran into tree and power lines in the road. This storm eventually produced EF4 damage in Cordova in Walker County. This is my video of the formation of this tornado, along with the location it touched down. When we came up on the initial damage (trees down on the road), our chase came to a major crossroads. Should we try to follow this storm or try to intercept a storm entering Greene County that was on a course for Tuscaloosa? John suggested hightailing it to Tuscaloosa. I was not confident that we could make it to Tuscaloosa ahead of the storm. But seeing that we had little alternative and considering that we always had the option of pulling back to be safe, I agreed with John. It was about 3:35 p.m. when we made the decision to go to Tuscaloosa. It was around this time that we were seeing ABC 33/40 cover a tornado live on towercam in Cullman. I tried calling my family there to make sure they were safe. John was driving his truck. Rick was following us in his truck. We made our way to US Highway 82. This thoroughfare brings you into Tuscaloosa County from the west. We passed through the communities of Buhl and Coker, west of Northport. I was still unsure if we were far enough ahead of the storm to have time to get south in front of it. To make matters worse, Rick was behind us, and we didn't know how far. I told John we needed to hustle south over the Black Warrior River and get down I-359 as soon as we could. As we crossed the river, I looked west out of the passenger window. I saw an amazing display of cloud to ground lightning due west of Tuscaloosa. Bolts of lightning were striking in what appeared to be the same location repeatedly. Comparing what I was seeing to our Gibson Ridge Radar software, the lightning was striking out of the rain free base immediately ahead of what was later confirmed to be the tornado. It was a hectic time. We were having to navigate and keep track of the storm on radar and in the sky. John's GPS link to the radar software was a great tool in helping us get in a safe place relative to the storm. But it was not the only thing. Years of spotter training and a knowledge of the geography of the area served us well. We could not see the tornado at this point. We knew by now we were safely ahead of the storm but we were concerned about Rick. If he followed the same route, we wondered if he would run into the tornado. Frustratingly, I could not reach him by phone. At this point, emotions and adrenaline were off the charts. I had a sense that this was going to be a major tornado by the time it approached Tuscaloosa. We then heard a report on ABC 33/40 that Meteorologist John Oldshue had streamed live video of a tornado leaving Greene County and entering Tuscaloosa County. Around this same time, Dr. Tim Coleman and Brian Peters were witnessing and reporting a large tornado on Interstate 22 in Walker County. I suggested to John that we go east on I 59-20 and pull off the interstate at the McFarland Boulevard Exit (U.S. Highway 82). We were on the ramp so in addition to having a great view of the sky we also had a very important escape route to the south or the east if we needed it. After we pulled off, we grabbed our cameras and video cameras. While filming, I continued to try to reach Rick. I finally reached him by phone. He was seeing the tornado and seemed to be safe before I lost the connection again. Here is his video. As I said in my video, we really were in the perfect spot. We saw the tornado gradually appear on the horizon. As it did, within seconds, it appeared massive as it approached Tuscaloosa. John managed to report this on the ABC 33/40 Skywatcher chat. This tornadic storm in Tuscaloosa was streamed live on Ustream from 4:40 until 5:20. ABC 33/40's James Spann and Jason Simson covered the storm live as did The Weather Channel's Greg Forbes. Words cannot express what went through my mind as I witnessed this beast approach a town I love and lived in for eight years. As it approached I imagined someone was about to be killed while he walked to his car after paying for his gas. I imagined a little old lady who might lose her life as she walked out of the grocery store. My mind was racing with thoughts of people being unaware of the danger headed their way. I felt helpless! It was too late to even send another report to help Tuscaloosa residents. All I could do was pray! If you watch my video, you will hear me say repeatedly, "Jesus help these people," or "Jesus help these people be safe." I have been amazed at the amount negative response to this on YouTube. There were so many hateful, derogatory, obscene, mean, and attacking comments about the fact that I prayed. I had many people ask that I turn the comments off on the video because some were so vile. I thought about it but I think it reflects the reality of this world and we should let people voice their opinions. Also, about the video, I took it down from YouTube for several days. It seems it was being stolen by certain media outlets and I was advised to bring it down until it could be protected. Thanks to Kendra Reed with KDR Media for help with this. It was a shame because John helped me get it online at his house within two hours of the tornado and it garnered a lot of interest. Not that it matters in the big scheme of things, but it would have had hundreds of thousands of more views. 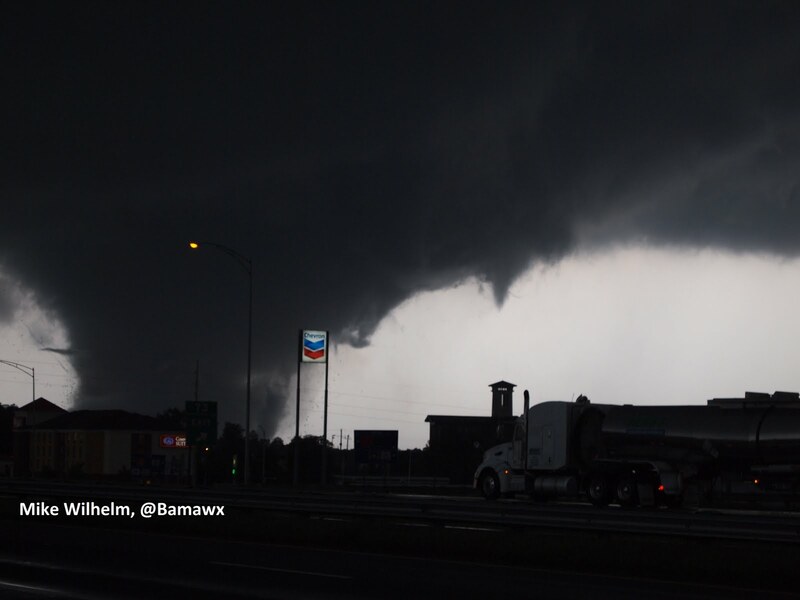 John and I followed the tornado up 20/59 from Tuscaloosa to Birmingham. Some have asked why we didn't try to drive into Tuscaloosa to help assist victims. It isn't that we were unwilling to do something to help, but there was no way we could have been in a position to get to where help was needed. Back in 1995 I helped rescuse a tornado victim, but it was a rare situation where I just happened to have easy access. Once the authorities arrived I was no longer needed. We stopped near Bessemer where John shot some video and I took some still photographs. John and I noticed that the storm became more rain-wrapped as it approached Jefferson County. We saw the storm as it was tearing up places like Concord to our north. The next day John and I witnessed the destruction at Concord. John was being interviewed by ABC News Nightline. One of my best friends, Tom Windsor, lived in Concord for years. They were also affected by the April 8, 1998 F5 tornado. The destruction we witnessed the next day was unbelievable. After seeing the damage in Concord on April 28, I thought there was a lot of high end EF4 damage. There were a lot of bare slab foundations. It was very sad to witness. Four or five people (at least) died in that little neighborhood. If that was the only community affected in the state it would have been on the national news. Sadly, it was only a small fraction of the horror our state experienced. I hope I never see anything like this again. There was warning. But there was nothing these people could do to be safe from an EF4 tornado unless they had access to an underground shelter. Our minds will never grasp the magnitude of this tragedy. When I witnessed first hand the kindnesses given to those affected in the wake of the storms, I am prouder than ever to be an Alabamian. Back to the chase. As we approached Birmingham, John asked me if I minded ending the chase. He was concerned about his family and wanted to check on them. Of course I told him that was a "no-brainer". 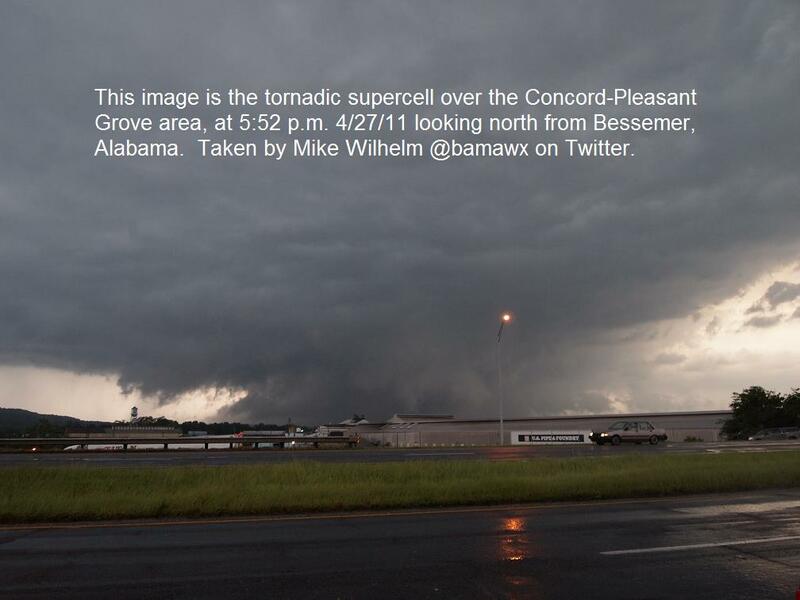 As we approached his home in the Trussville area, we were very close to the area of circulation. We didn't know it at the time, but the tornado temporarily "lifted" just east of Fultondale. John and I tried to take shelter in a gas station but the employees had locked the door and would not let us in. We drove to John's house. His family was ok. I was finally able to get in touch and find out that my sons in Cullman were ok. By this point in the day cell phone service was becoming spotty in many areas. We uploaded my video and sent reports to ABC 33/40. My vehicle was still in Cullman. John had to drive me back to Cullman. It was after dark and we began to wonder if the Cullman tornado hit the area where my vehicle was parked. The magnitude of the storm event was such that we had no idea, even by this hour, how many parts of the state were devastated. Everything was completely dark north of Birmingham. The North Alabama tornadoes had destroyed the power infrastructure. After we found my vehicle, surrounded by utility trucks, I drove home to Huntsville. With no power and no moonlight it was surreal driving home. The normal glow in the sky over Decatur, Madison, and Huntsville was missing. As I drove through Huntsville I only saw lights at the hospital and police station, which were running on generator power. As I pulled in my driveway, my garage door opener didn't work (of course), and as I opened the car door I heard the roar of generators in the neighborhood. I used the light of my Droid phone to get me to the back door of the house. Then I looked for candles and flashlights and a radio. I could tell from the radio that things were worse up in North Alabama than I realized. Here are some of other links of interest. I will be adding to this list over time. The May 3, 2011 Weatherbrains, Episode 275, was a two hour special. Regulars James Spann, Bill Murray, Dr. Tim Coleman, and Kevin Selle were joined by John Oldshue, John Brown, and Mike Wilhelm to simply share their thoughts on the horrible April 27, 2011 tornado outbreak that has killed over 300 people across the Deep South and injured thousands more. Dr. Jon Nese of Penn State University describes the forecasting of the tornado outbreak as well as the warning process in his weekly program, Wxyz (Weather Whys) which airs on Pennsylvania Public TV. In September 2011 I had the pleasure of visiting Dr. Nese as he gave me, Bill Murray, Ben Smith and other guests from Alabama a tour of the PSU Meteorology Department. Penn State people did a lot to reach out and help Alabamians. WHNT 19's Michelle Stark tells the story of this historic tragedy through YouTube videos. WSFA Montgomery's Rich Thomas showed radar history of the Tuscaloosa-Jefferson tornado. John Brown raised money for victims selling We Are Alabama tee shirts. ESPN visited Tuscaloosa and did a special story on the tornado recovery in May. My video was used in that story. James Spann wrote a famous blog post about the warning process that was even covered by the media in the UK. NOAA movie showing the rapid scan infrared imagery from the GOES-East weather satellite from April 26-28, 2011. Miraculous story of survival and recovery of one Alabama student. NWS Meteorologists "detective work" in performing numerous, massive storm surveys. Crazy video someone took inside the Fultondale tornado. Birmingham NWS Meteorologist in Charge Jim Stefkovich describes the event. I still tear up watching that video, hearing your heartfelt cries out in prayer for those helpless people. A day that will never be forgotten. Great account. I hope it brings you some healing from the tragedy. Thank you so much for sharing your story. I live in Ringgold, GA, which was also affected that day, although not as severely as what happened in Alabama. I understand your feelings, and I cannot even begin to imagine what it was like seeing all that happen first hand. Thanks again for sharing your story. Your video is one of the few I have brought myself to watch, and your cries echo the cries of many of us who felt helpless watching at home. Thank you ladies for your nice comments. It was a very sad day. So many people were affected that day, directly or indirectly. I live in the Coaling community, not far from the Eppes, and has substancial damage to my home. We were fortunate. We heard the warning and were able to get to the hallway before the tornado pulled a tree through our home. It is because of people like you...willing to gather data to learn about these storms...o that future outbreaks can be warned for. I thank you for that. ...Mike this has to be he best account so far...so many things I had forgotten and you brought them back to me. Once again I am driving and you call and tell me "look west" as I cross I59/20 I didnt realize how our lives were about to change in the next few minutes.. Part of me was lost that day... God bless you and John..Til the next chase my brothers.. Thanks for sharing what happened. It was an emotional day for everyone in the meteorological community and still makes most of us tear up reading how it all transpired. I hope none of us live to see another day like April 27th. It has been an incredible year of destructive weather. Let's hope 2012 is a bit more calm. Many many lives were saved that day because of the heroic efforts of spotters, NWS warnings, local media live broadcasts, and others in OEM and the first responder community. We will never know how many lives were saved - but no doubt it was many. Great blog-I know a lot of people share your feelings & emotions.I certainly do-my daughter and I were visiting Tuscaloosa for a couple of days before heading for my nephew's wedding inHuntsville We live in Oklahoma and are all too familiar with tornadoes and severe weather. We encountered heavy thunderstorms in eastern Oklahoma, & tornadoes in Arkansas on our way over. While visiting campus & shopping earlier that day, we discussed the possibility of bad storms;we went back to our hotel room to check with the weather channel before heading out to dinner. We rode out the tornado in the bathtub of the Holiday Inn Express on 15th Street just a little east of McFarland & north of University Mall;it barely missed us. The immediate aftermath & that evening are foggy because I was probably in a mild state of shock. We continued on to Hunts- ville the next day. I shared my "story" with family & friends but can't shake the sadness & fear of and from that day. God bless all the people affected that day, & God bless Sweet Home Alabama. are those who make outrageous remarks just to get attention or try to get someone to respond to them. mountain, and it was the worst I have ever seen. I always watch James, because he stays on as long as there is a threat anywhere. Thank you gentlemen, for what you do. Thanks to each of you for sharing your stories, encouragement, and kind comments. Let's hope nothing like that day ever happens again.